For six months Tsipras and the recently discarded finance minister, Yanis Varoufakis, shuttled between Athens and Brussels, Berlin and the other centres of European money power. Instead of social justice for Greece, they achieved a new indebtedness, a deeper impoverishment that would merely replace a systemic rottenness based on the theft of tax revenue by the Greek super-wealthy – in accordance with European “neo-liberal” values ­ and cheap, highly profitable loans from those now seeking Greece’s scalp. The day after the January election a truly democratic and, yes, radical government would have stopped every euro leaving the country, repudiated the “illegal and odious” debt – as Argentina did successfully ­ and expedited a plan to leave the crippling Eurozone. But there was no plan. There was only a willingness to be “at the table” seeking “better terms”. “I bow to the criticism that I have campaigned on an agenda founded on the assumption that the left was, and remains, squarely defeated …. Yes, I would love to put forward [a] radical agenda. But, no, I am not prepared to commit the [error of the British Labour Party following Thatcher’s victory]. The leaders of Syriza are revolutionaries of a kind – but their revolution is the perverse, familiar appropriation of social democratic and parliamentary movements by liberals groomed to comply with neo-liberal drivel and a social engineering whose authentic face is that of Wolfgang Schauble, Germany’s finance minister, an imperial thug. Like the Labour Party in Britain and its equivalents among those former social democratic parties still describing themselves as “liberal” or even “left”, Syriza is the product of an affluent, highly privileged, educated middle class, “schooled in postmodernism”, as Alex Lantier wrote. I agree with Pilger here, except for his recommendation to expedite a plan for Greece to leave the Eurozone. If a fundamental principle of Marxism is that you can’t have socialism in one country — especially in a small country like Greece, in this global capitalist system — then how can one argue that Greece should voluntarily leave the Euro and the European Union and go it alone, as though that would bring Greece closer towards establishing a socialist state? My approach would be to do everything Pilger says, and more — cancel the debt unilaterally, accept NO austerity, nationalize the banks, expose Germany’s non-payment of its own loans after WW2 and its much larger debt burden (the U.S., remember, is the largest debtor nation in the world! ), apply for loans from competing capitalist sectors (Russia, China) and play them off against the German bankers — while intensively propagandizing the people of Greece, prepare them for being thrown out of the EU but do not leave voluntarily — issue no statement about leaving the EU, which as I understand it has no way of throwing out a member country. In other words, force the contradiction. Force them to throw you out, if that’s what the EU will do. It will create a huge fracture. And appeal to the working class in Europe to do the same in their own countries. I don’t understand what would be gained by voluntarily leaving the EU and going back onto the drachma. Bring the fight INTO the European Union and the centers of global capital. The two articles below — one from a Left writer and the other from the NY Times — are fascinating in where they contradict each other …. which is everywhere. Here’s my short version (without going into the long history) of what’s happening since the landslide vote last week rejecting the European Union’s central banks’ program to impose severe austerity on Greece. First, the EU bankers wanted a change in Greece’s finance minister. Syriza acquiesced and replaced the aggressive Varoufakis with Tsakalotos. Instead of being sufficiently appeased, that just whetted the bankers’ appetite and they sharpened their knives. Greek Prime Minister Tsipras was empowered by the landslide vote “No!” He wanted that in his pocket. Then, instead of playing hardball (by inviting Russia to lend Greece the funds needed to ease the social misery, which would throw the EU bankers into panic), he went on to concede almost all of the EU’s and IMF’s austerity measures in an attempt to translate that (and the “No” vote) into a large European bailout for Greece of between $50 billion and $72 billion. The idea is that the impact caused by accepting such horrible austerity measures — such measures have elsewhere been termed “Structural Adjustment Programs” or (SAPs) — would be bufferred by the bailout, which would ease, at least temporarily, the suffering in Greece. The corporate media had framed last week’s referendum as a vote to exit the Euro (Greek Exit, or “Grexit”). That was most definitely not the point nor even the implication of the referendum, despite the fact that many commentators see it that way. But there’s no logical nor legal reason (there may be good or bad political reasons) for the Greek government to leave the EU and the Euro; they can remain inside and keep pressing their case. They know they are up against cutthroat capitalists. They also know that there is no administrative way to ameliorate this crisis. Perhaps they hope to hold on long enough to spark the working class in other countries facing a similar situation to join in revolt, and make it impossible for the bankers to single out Greece. If that’s indeed the case, Syriza needs to state that explicitly. Otherwise, they are simply appearing to be sellouts, caving-in to the pressure of the EuroBankers. Next stop: Fascism. That’s my own tentative quick summary, which is open to correction and discussion. (I appreciate your feedback!) Please also read at least the first article, below. It is gut-wrenching, watching Syriza beg, and plead with the creditors not to crush Greece. Too late did they realise that they weren’t negotiating. They had nothing to do negotiate with, no cards to play. They went looking for the ‘good euro’, and found only ruthless, mercenary capitalist enforcers. They sought compromise and were given fiscal strangulation. Even after their big deal with the creditors in February, wherein they gave up most of their emergency programme, none of the money they expected was forthcoming. Their means of raising money were cut off. For months, and months, they made concessions; the troika made none. Finally, they were all set to sign up to a deal considerably worse than any imposed on previous governments. The troika demanded more, on pain of destroying the banking system. Now, it seems, Syriza has caved and proposed a deal which is even worse than the worst. Cuts. Privatisations. Pension ‘reforms’. VAT increases. Recessionary measures. Barely a trace of a progressive agenda left here, notwithstanding the strenuous and heartbreaking efforts of euro-leftists to give it a gloss. In some respects, they have delivered, after months of fighting, a more complete victory to the neoliberal managers of Europe than the latter could have won on their own account. The social catastrophe that has befallen Greece is now going to be prolonged — the suicides, the premature deaths, the medicine shortages, the starvation, the wage losses, unemployment — but without any possible conviction that, say, a new radical left government might be elected and put an end to the misery. What sort of political forces might stand to gain in that terrain is obviously undecided; but we have seen what the worst of it could be. In a way, none of this is surprising. The only possible coherent basis for any alternative to austerity was a Grexit prepared for early on, both in terms of public opinion and effective war-readiness. There was nothing else coming down the pipeline. The dominant forces in the Syriza leadership wouldn’t have it. Not for a second would Tsipras, Dragasakis, or the recently appointed negotiator Tsakalotos, allow this outcome. For them, Grexit was worse than austerity. Of course, even if they thought that was true, the failure to even plan for such a contingency, to wargame the possible outcomes and get people in the state apparatuses ready to act, was a huge mistake. I am not forgetting that they are a left government trying to operate within the confines of a capitalist state penetrated by imperialism. I am not oblivious of the fact that the permanent state apparatuses may have sabotaged and undermined them at every turn — certainly, the constant leaks undermining the previous commitments against privatisation suggest civil service lobbying. So it’s quite possible that a Syriza government trying to prepare for a situation tantamount to war — Grexit being a huge national effort, not something a few technocrats can manage — would have been subverted and sabotaged quickly. But from what I can see, all efforts have been obsessively focused on negotiations, and those have delivered precisely worse than nothing. So what was the meaning of last week’s referendum? Why did they call it, and what happened to ‘Oxi’? It is fair to say that the Syriza leadership never expected 61% of Greeks to actually support them. Neither did I. The ‘Oxi’ rallies were enormous, but the fact of this translating into such a tremendous surge at the ballots, mostly coming from the working class and from younger voters — but actually spread across all the districts of Greece, the rural as much as the urban — bespeaks a revolt on the scale of the ‘national-popular’. No one could have anticipated it. So what did they anticipate? We could infer the answer from their behaviour. On the day after the referendum, Varoufakis was relieved of his negotiating duties (leaving aside his generally right-cleaving positions, the creditors evidently hate him), and instead a new team including delegates from To Potami and Pasok was sent to discuss the terms of surrender. Tsakalotos sent a letter pleading for a new bailout, with a promise of a new memorandum. This move would have made much more sense had there been a narrow vote for ‘Yes’, or even a narrow ‘No’. It makes no sense at all now. It is at least plausible that Syriza leaders would have preferred to lose and be forced to resign, rather than take responsibility for this deal. It is also plausible, lest we overlook the option, that the Syriza leadership is utterly at sea, pulled hither and thither by tides and winds it knows nothing of. Whatever the reason, the referendum did happen and the result was astonishing. The majority of Greeks did come out to clearly reject austerity. The public protests and rallies building to it, against the ferocious pressure of the reactionary media and the threats of the Eurogroup, almost had the character of a social movement. If we’re fortunate, they were the beginning of one. This introduces a significant cleavage between the government and its base. Objectively, that is the basis of a political split. 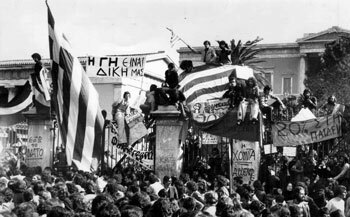 Whether anyone in Syriza will recognise that remains to be seen. As I write, we’re waiting to see what the parliamentary votes will look like. There is immense pressure on Syriza MPs to give Tsipras the authority to negotiate and finalise a deal on this basis. There are all sorts of lures being dangled. Maybe the Eurogroup will sink it. Maybe if the final deal is terrible you can oppose it then. Hold tight for now, and things will look better in a few days. And rods being wielded. Don’t make Tsipras look bad. Don’t bring the government down. Don’t let the European masters have that victory. So it is important to be clear: if Syriza supports and implements this deal, it is over. It will not recover. It may exist as a party, but as a force of the radical left it will be all but redundant. It may as well be a centrist, austerian coalition. A left that goes along with this will be committing suicide. And finally, don’t put your faith in the idea that maybe if Syriza hangs in there, does what it’s told, eventually, after a while, Podemos will come, maybe some other radical left formations will come, and the balance of power will tilt. Even if that was how the European institutions work — and they have proven they aren’t susceptible to that kind of pressure — this outcome will seriously undercut the chances for the European radical left. Be clear that we are looking a world-historic defeat in the eye. And act accordingly. BRUSSELS — ­ A meeting of European finance ministers broke up late Saturday with no agreement on whether Greece should be granted its third bailout since 2010, reflecting deep divides over whether the Athens government can be trusted to repay huge new loans and leaving the Continent hours from what could be a historic rupture. The finance ministers planned to reconvene on Sunday, just before European national leaders are scheduled to meet in Brussels for what they have said would be a final decision on whether Greece should qualify for a new aid package, a step aimed at determining whether the country can remain in the euro currency union. The failure by the finance ministers to reach an agreement, after nearly nine hours of talks, belied the optimism that followed the approval early Saturday by the Greek Parliament of a package of pension cuts, higher taxes and other policy changes long sought by Greece’s international creditors. In a remarkable turnabout, Prime Minister Alexis Tsipras had pushed the package through the legislature despite having led his country into a referendum six days earlier that overwhelmingly rejected much the same terms. Despite Greece’s capitulation on those terms, many countries came into this weekend’s final round of negotiations skeptical of the Tsipras government’s commitment to seeing through the changes and putting his country on firmer financial footing ­ and weary of the constant brinkmanship that has characterized the months of negotiations over Greece’s latest crisis. Instead of working through the night to hammer out a statement on requirements for Greece, as had been expected, the meeting was suddenly called off shortly before midnight, and ministers left without even holding a formal news conference. “The issue of credibility and trust was discussed, and also of course the financial issues involved,” Jeroen Dijsselbloem of the Netherlands, the head of the so-called Eurogroup of ministers, told reporters. “It is still very difficult. but work is still in progress,” he said, adding that discussions would continue later Sunday morning. From the start, it was clear that Mr. Tsipras’s gambit had not entirely won over Germany and other countries that have been skeptical about giving a new round of loans to Greece after years in which successive governments in Athens have struggled to carry out changes that creditors have demanded as a condition of the bailouts. His prediction proved accurate, as he and fellow ministers wrangled with little apparent progress, seeking more assurances from Greece that it was committed to changing its ways, and weighing the desires of France and Italy for a deal against the more skeptical stance of Germany and the possibility of outright opposition from Finland. During their talks, the finance ministers called on their Greek counterpart, Euclid Tsakalotos, to put the package proposed by his government into swift effect to prove its willingness to make deep and lasting changes to the nation’s faltering economy. Greece, in turn, continued to seek some assurance that it would win the right to renegotiate the terms of its debt repayment. It was not clear that the finance ministers’ meeting on Sunday morning would yield a consensus about how to proceed, increasing the possibility that they would leave final decisions to their national leaders, who are to gather in Brussels in the afternoon. “I am still hopeful,” Pierre Moscovici, the European commissioner for economic affairs, told reporters as he left the Eurogroup meeting. In an apparent effort to raise the pressure on Greece, some officials earlier in the day were informally passing around a one-page position paper, reportedly drawn up by the German finance ministry as a possible option for the negotiations, saying the Greek proposal fell short and suggesting options that included ideas like having the country leave the eurozone for five years and reapply for membership. The idea of a break from the euro was not openly discussed at the meeting, according to one of the officials with direct knowledge of the talks, who like others spoke on the condition of anonymity because the discussions were private. Mr. Schäuble, however, referred repeatedly to a plan drafted by German officials that would require Athens to transfer state assets into a trust fund to pay down its debt in order to stay in the eurozone, according to two people with direct knowledge of the discussions. Mr. Schäuble did not refer explicitly to the idea of a temporary Greek departure from the eurozone, these people said. But the tough approach by the German minister, they said, appeared designed to make clear that he now favors a Greek exit. The European leaders have set this weekend as a deadline for settling the issue of whether to keep Greece solvent or cut off further aid, a step that would almost certainly result in forcing Athens to abandon the euro. An exit by Greece would be a blow to Europe’s goal of ever-closer integration. Greece’s banks are teetering on insolvency, the government is running out of cash to meet day-to-day obligations, and without an infusion, additional payments to international creditors will be missed in coming weeks. Experts who reviewed Greece’s request for a third bailout program informed Eurogroup ministers that about €74 billion is needed to cover its financing needs for the next three years, according to a person with direct knowledge of the experts’ findings. That is far more than the €53.5 billion, or about $59 billion, that Athens has requested. If loans for Greece are eventually approved, the majority will probably be covered by a new loan from the European Stability Mechanism, the European bailout fund. Other sources could include loans from the International Monetary Fund, funds raised through Greek government revenue and, eventually, new debt issued by Greece. That discrepancy between what Greece had requested and the new estimate of its bailout needs may have further reinforced the doubts of those who wonder if the Greek government has a handle on its finances and will be able to carry out promised changes. While no signed bailout deal was expected this weekend, the question is whether Europe will decide to continue negotiating a rescue with Greece, or leave its banks to collapse and its virtually bankrupt government to default. European leaders have said their Sunday evening meeting could be used to reach that decision. The fear of Greece and its supporters, which include the French government, is that without an agreement to continue negotiations, Greek banks could collapse next week, raising the prospect that the country would quickly have to abandon the euro. Mr. Moscovici, the European economic affairs commissioner who is a former finance minister of France, said as he entered Saturday’s meeting that the “Greek government has made significant gestures.” He said the Greek proposals form “a basis for a new program” of loans. Before the meeting, the finance ministers received assessments of the Tsipras plan by experts representing the creditors. The Eurogroup, with its 19 eurozone finance ministers, has some outspoken critics of Greece, irritated by the Tsipras government’s negotiating style and Mr. Tsipras’s decision the week before last to break off negotiations and call for the referendum. Mr. Tsipras surprised many in his own country and party on Thursday when he presented a plan containing many of the elements ­ including austerity measures ­ that the voters had just rejected by a wide margin. The creditors now want strong evidence that Greece will honor its latest set of economic promises if it gets the new loans it is seeking, and an agreement to ease the burden of its current debt, which at €317 billion is equivalent to 177 percent of the country’s gross domestic product. By that measure, only Japan’s debt, at 245 percent, is higher among the world’s economies. A version of this article appears in print on July 12, 2015, on page A1 of the New York edition with the headline: Finance Leaders Call It a Night Without a Deal.